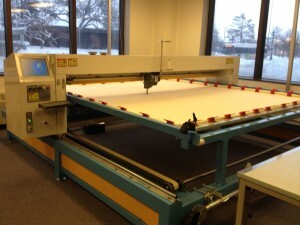 Behemoth is our Quilt Master IV full-frame quilting system, aka Quilt Plotter. She can running-stitch intricate designs over an area of up to 96" x 104" (2.4m x 2.6m). This is large enough to make a quilt that covers a Queen size bed with lots of drape down the sides, or a King size bed with somewhat less drape. She works at up to 1500 stitches per minute. Including the inevitable thread breaks, bobbin changes, and slowdowns due to complex curves, she can put in about 300,000 stitches in an 8-hour shift. Depending on overall area stitched, a sparse design can be done in hours, while something as dense as our $1000 bills takes days. Our Brother 10-needle embroidery machine stitches multi-color designs, automatically cutting the thread and changing color. The maximum area for a single design is 7.8" x 14" (200mm x 360mm). 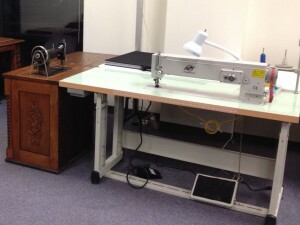 With speeds up to 1000 stitches per minute, Sue can fill a square foot of fabric in one to three hours, depending on the density of the design being stitched. Hank is a mid-arm (20" throat) zig-zag walking foot sailmaking machine. We use him for twill tape binding and large-scale Trapplique. So named because this machine was brought back from the dead. The Davis Vertical Feed has no feed dogs, instead using a needle feed and walking foot. It's the best machine ever for binding, except possibly a Chinese factory binding machine, which we don't have. The Singer 201 is regarded as "the finest machine Singer ever made," but treadle versions were never distributed in the US. Vicky is an English 201K, brought from London by Theo and dropped into a Singer drawing room cabinet I got off eBay. 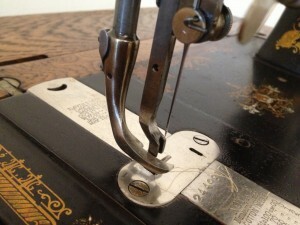 She is quiet, smooth, well-balanced, and my favorite straight-stitch machine for piecing. 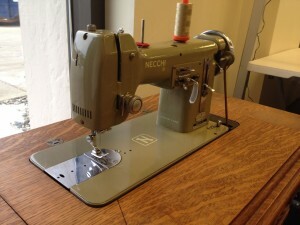 Becky does straight stitch and zig-zag and is a whisper-quiet marvel of mid-century Italian engineering. 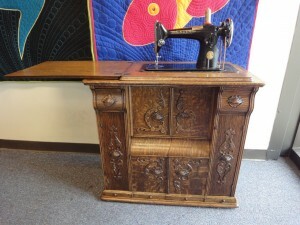 We took off her motor and dropped her in this Singer treadle table. 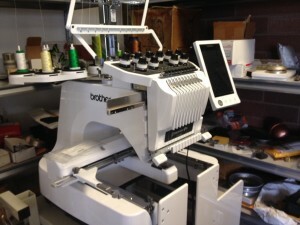 On those rare occasions I do Free Motion Quilting by hand, Becky's my machine of choice .